got the old 1.6. I tried everything!! Nothing seemed to work as promised. After some research, I found this little tidbit of help that worked. It seems that there is a file installed with OSX that tells the OS what version of Java to use. The file is a symbolic link to the location of the Java you want to use. OK. So you have already installed Java 1.7 and tried to set the JAVA-HOME environmental variable, tried the System Preferences and nothing works? Try this. 1. Install the new version of Java. 2. 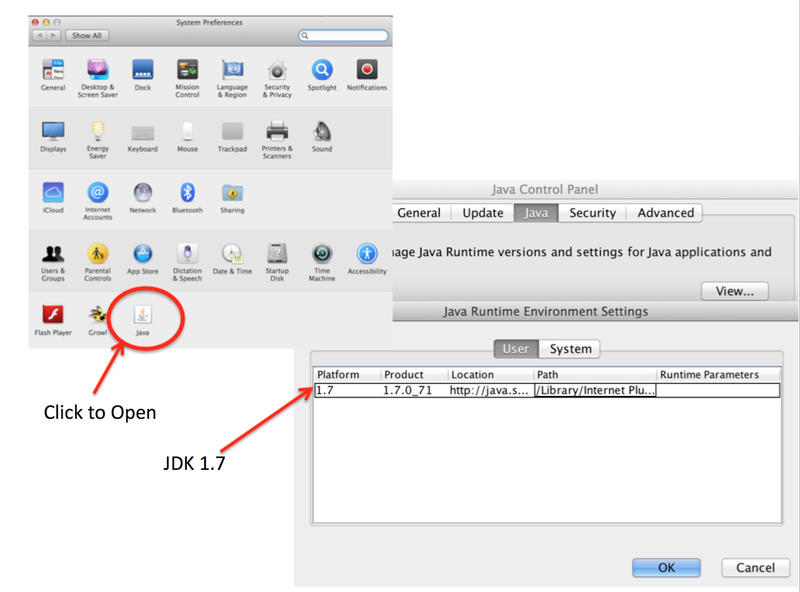 Open System Preferences and click on the Java icon. Open it up and make sure that Java 1.7 is selected. 3. Open up your Terminal and navigate to /System/Library/Frameworks/JavaVM.framework/Versions/ . This is done by using the command "cd /System/Library/Frameworks/JavaVM.framework/Versions/". 4. In Terminal, type "sudo mv ./CurrentJDK ./CurrentJDK_old". This simply renames the file in case something goes wrong. To execute a command with sudo, you will be asked for your password. This is the admin password to your computer. Go ahead and enter it. The CurrentJDK symlink was pointing to an older Java version. Removing this file (directories are actually "files" in Unix systems) and create a new one pointing to the new Java JDK. Since the current directory is owned by a privileged admin, you will need to use the sudo command. 5. In the Terminal, type "sudo ln -s /Library/Java/JavaVirtualMachines/jdk1.7.0_55.jdk/Contents/ ./CurrentJDK"
That is it! You may delete the old CurrentJDK_old file if you wish to. If you now type in "java -version", you should see the new Java. If this worked for you, please consider sharing this on Facebook or Twitter. Some Neo4J Training Spots Still Available!